Ashington FC manager Steve Harmison will tell his players to enjoy the seasonal festivities but then give him the perfect belated Christmas present with a derby day victory. They face Bedlington Terriers on Boxing Day at Welfare Park, kick-off 11am. The Colliers go into the showdown chasing a season’s double after triumphing 4-0 in the corresponding game between the two outfits on August Bank Holiday Monday. Harmison said: “The Terriers are having a fight at the bottom of the table but I reckon it will be a spicy affair, hopefully in front of a good crowd and played on a pitch which I would imagine will be heavy. “These games are always ones to look forward too whatever camp you are in, and there will be a lot of familiar faces in the respective dressing rooms. “We include Lee Scott who scored loads of goals for Bedlington last season, Dylan Williamson, whose education in Northern League football came at Bedlington, and James Harmison, who spent 12 to 13 years with them, during which time he won a lot of trophies in a good side. “There will be good emotion going back, as well as a feel-good factor, but in the home ranks will be Marc Walton, Andy Ferrell and Tony Stephenson and it will be good to see them again. The boss will be boosted by the return of his brother James [Harmison] following a recent hernia operation, but is keeping his cards close to his chest as to whether the central defender will be thrust straight back into the side. “James will be in the squad but after playing for an hour against Seaton Delaval in a friendly last weekend, we will have to wait and see if there is any reaction before making any decision,” he said. “James has a wealth of experience in marshalling people and understands what the pitch is all about. Meanwhile the Woodhorn Lane boss sent a thank you message to Northern Alliance premier division side Seaton Delaval Amateurs after they agreed to a behind-closed-doors friendly at short notice when the Colliers’ trip to Norton & Stockton Ancients in the Ebac Northern League was called off due to a waterlogged surface. Harmison said: “There was an air of negativity and disappointment in our camp after back to back defeats and poor performances against North Shields and Seaham Red Star. “It’s very hard and difficult to pick yourself up when you have come off the back of two performances which haven’t gone the way the dressing room would like. “To be honest I was worried where that game could have gone against Delaval because we were on a little bit of a downer and feeling sorry for ourselves, and the longer you go without playing, so the negativity and energy saps out of you. He added: “I would like to thank Seaton Delaval who agreed to the game on Friday night. 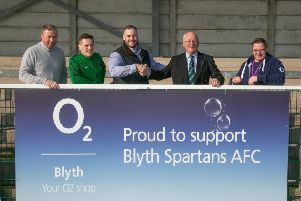 “They are flying high in the Northern Alliance premier division and it was good to see some players with Northern League experience and some who had previously played for Ashington, the likes of Peter Snowdon and Michael Fenwick. “All in all, it was a good exercise against a team who are on the up in the next step down. “My lads were chomping at the bit but there attitude and the way they went about the task was very good.